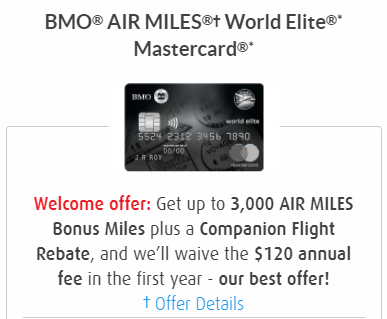 If you apply BMO AIR MILES World Elite Mastercard before November 30, 2017, you could earn up to 3000 Air Miles bonus miles + a Companion Flight Rebate + First Year Free. This is no doubt the best offer for this credit card. AIR MILES Bonus Miles Offer: Receive 1,000 Bonus Miles after your first purchase using your Credit Card. Receive an additional 2,000 Bonus Miles when you spend a minimum of $3,000 (less refunds and excluding cash advances, cash-like transactions, interest charges, fees, credit or debit adjustments) on purchases using the Credit Card within the first three (3) months from the Credit Card open date. Companion Flight Rebate Offer: To be credited the Dream Miles for your Companion flight ticket, you must book any two flights (one way or return) for travel anytime (subject to availability from participating suppliers at the time of booking) through airmiles.ca using your Dream Miles before November 30, 2018. Both flight tickets must be booked in the same transaction, and on the same itinerary (both flights must be travelling on the same day, departing from the same location in Canada, and arriving to the same destination). You must have accumulated a sufficient balance of Dream Miles in your Collector Account to use for both flights in the same transaction to be eligible for this Offer. You will be credited the number of Miles back into your Dream Account that is equal to one flight ticket (excluding all taxes, fees and applicable surcharges) within 45 days after your flight booking, notwithstanding your balance preference (between AIR MILES Cash and AIR MILES Dream balances) at that time. To be eligible for this Offer, your BMO AIR MILES World Elite Mastercard account must be in good standing at the time such Miles are credited to your Dream Account. The Collector is responsible for paying all taxes, fees and applicable surcharges at the time of booking. There are no cancellations or refunds permitted on tickets once booked. Changes to flights may be permitted; restrictions may apply and changes are subject to applicable fees. In the event of a cancellation of either flight for any reason after booking, Dream Miles credited for the Companion flight may be deducted back from the Collector’s Account. Offer cannot be combined with any other Miles redemption offer. Offer is subject to the Flight Rewards Terms and Conditions of the AIR MILES Reward Miles Program, available on airmiles.ca. Annual Fee Waiver Offer: The primary cardholder annual fee of $120 will be waived for the first year. After the first year, the annual fee will appear on your Credit Card statement twelve (12) months after the Credit Card open date. Offer does not apply to the Additional Card annual fee.